What are some benefits of Diamond Light Vibrational Healing? You cannot solve your problems at the frequency in which you created them. Become lighter and more positive. Miracles will happen! Fully embrace your life with great joy! Whether you are ready to go to your next level in your life or have serious health issues or just want to feel better than you do, I can help you, either in person or over the phone. Energy knows no boundaries of time or space—I can work with you no matter where you are. The Diamond Light frequency is the highest frequency you can be in. We use Diamond Light in our Diamond Portals of Light Vibrational healing sessions. Just like there are many facets to you, there are many facets to Diamond Portals of Light Vibrational healing. One way it works is by healing any wounds that have been festering in your body or energy field. The Diamond Light transforms the wounds when it comes in contact with them. In a manner similar to the way alchemy transforms one substance into another. However, the Diamond Light is a higher vibration and a finer frequency, so it can quickly get to hidden places to put them right. It is ever so loving, gentle, soothing and blissful. For example, it can transmute a toxic emotion to a healthy emotion or a distorted cell to a healthy cell. I am the alchemist who sparks your innate healing wisdom—but it is you that effortlessly performs the final transformation of change. I serve as the conduit for your healing by clearing a path for energy blocks and organs to repair, emotional trauma to heal and ultimately for you to attain your optimum health and balance of your being. As your frequency gets higher and stronger we can go deeper and wider into your being until your Diamond Light is completely ignited and has a strong bright radiance. I am igniting it in the client. The reason it is called a portal is—I received the name through my channel. We have to go through a specific portal to be in the Diamond Light. How I see it is your core light has a steady soft glow where as the Diamond Light is brilliant, vast and sparkles like diamonds. It is the highest frequency and keeps us in a positive “win-win’ state of mind and body. It is the state one can reach from years of meditation. The crystal bowls, angels and masters can take you there. And they can do it quickly, without the years of meditation. Like other forms of healing we have to be activated and practice holding this Light until it becomes part of us. That is my job as the healer-channel. In the Diamond Portals of Light Vibrational healing sessions I work with—you, your higher self, the Diamond Light, vibrational sound, the chakras, angels and the healing masters. Every person’s session is customized based on your needs. The result? You’ll manifest your dream—to be and have an awesome life! As a healer, I will help your physical and energetic bodies to access the innate healing power that is available to you.. This process may take time. Many people feel instantly better after a session; some may briefly feel worse before feeling better, while the energy is rebalancing. It is all part of the deep process that ultimately leads you to greater health and happiness. Disease typically stems from trauma, negative beliefs, and childhood wounds that cause an imbalance in your energy field. We now have environmental toxins severely affecting some people. These can all lead to physical, mental, emotional, or spiritual illness. Symptoms generally manifest after years of being energetically out of balance with yourself and the environment. Diamond Light Healing sessions can get rid of the toxic buildup in your energy field before it manifests in your life. This powerful healing work is for those who are ready to raise their vibrational frequency and live a truly awesome life. To make sure this work is right for you, I offer new clients a Free 20 minute Clarity phone session – “From Pain to Bliss“! It is the intentional use of sound to resonate with specific parts of the energetic or physical body. It works by reinstating the correct sound pattern that will help an organ or system return to its natural state of resonance. It is as natural as listening to music to lighten your mood or singing to an infant to soothe her to sleep. 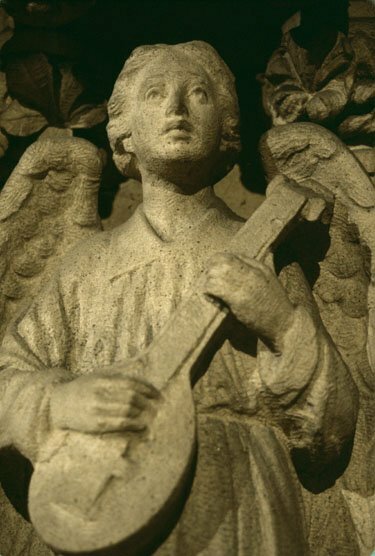 The power of sound has been acknowledged since the beginning of time. Indigenous cultures and ancient traditions worldwide recognize the power of sound to heal and transform consciousness. The Tibetans use bells, chimes, bowls, and chanting to deepen their spiritual practice. Native American medicine men and Australian Aboriginals use toning and repetitive sounds, along with instruments created from nature, in sacred ceremony to adjust physical or spiritual imbalances. Many African cultures use voice and drumming to bring them closer to Spirit. Sound is a major part of individual and group worship in nearly every religion in the world. Prepare for and heal from surgery. Sound healing before and after surgery can help repair the cut energy field of your body and accelerate healing from the inside out. Repair the nerves and nerve endings to heal conditions such as multiple sclerosis, carpal tunnel, and arthritis. Revitalize your energy by balancing the chakras and energy field. Dissolve and flush away diseased cells. Aid in detoxification, particularly of the liver. A trained sound healer acts as a catalyst to intentionally shift vibrational imbalances and effect physical and energetic healing. Sound has been scientifically proven to affect our autonomic, immune, and endocrine systems, as well as the neuropeptide transmitters in the brain. Many prominent physicians and scientists have acknowledged the effect of sound on matter. Dr. Hans Jenny pioneered the study of cymatics, the use of “pure tone” or “sine waves” within the audible spectrum to produce physical patterns on sand or liquid. Dr. Masaru Emoto observed how the crystalline structure of water changes in response to different sounds. Since our bodies consist of 80% water, they too respond powerfully to sound. Mitchell Gaynor, MD, board certified medical oncologist and Senior Medical Oncology Consultant at The Strang Cancer Prevention Center, used sound to help cure cancer patients. He employed music-based meditation and music therapy, including Tibetan and crystal bowls, in his integrative approach to cancer treatment. His book Healing with Sound chronicles a thorough study of sound healing. Andrew Weil, MD, the well-known healing pioneer and best-selling author who was twice featured on the cover of Time magazine, has long been fascinated with the ability of sound to induce states conducive to healing. According to Weil, sound sparks a process called entrainment wherein bodily processes such as respiration, heart rate, and brain waves synchronize with the frequencies of what we hear. He promotes the use of sound for managing diverse conditions ranging from depression to chronic pain to Parkinson’s. 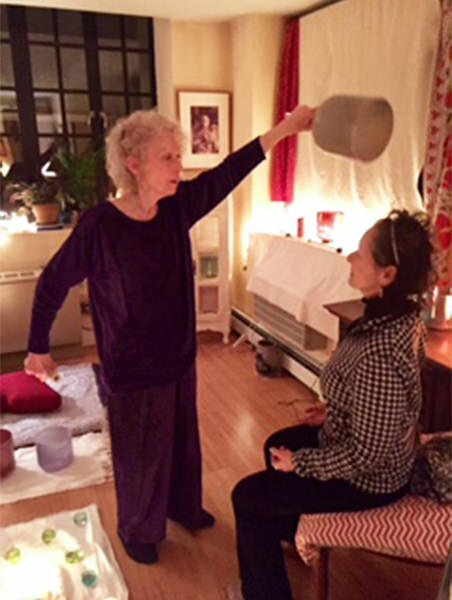 Sylvia Moss is a highly trained and experienced sound healer. 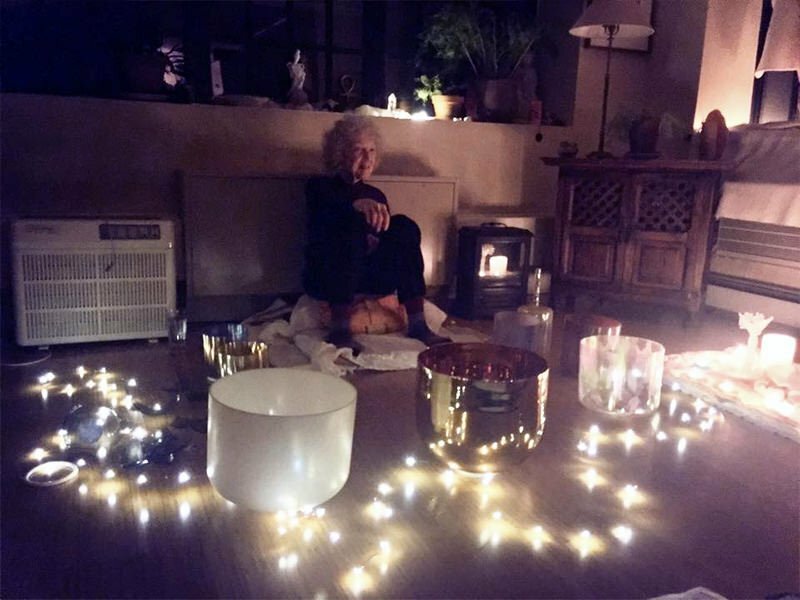 She uses vocal toning, Alchemy Crystal Singing Bowls –Vessels of Light, drums, rattles and special sterophonic music to remove energetic blockages and restore balance to the cells and energy systems. 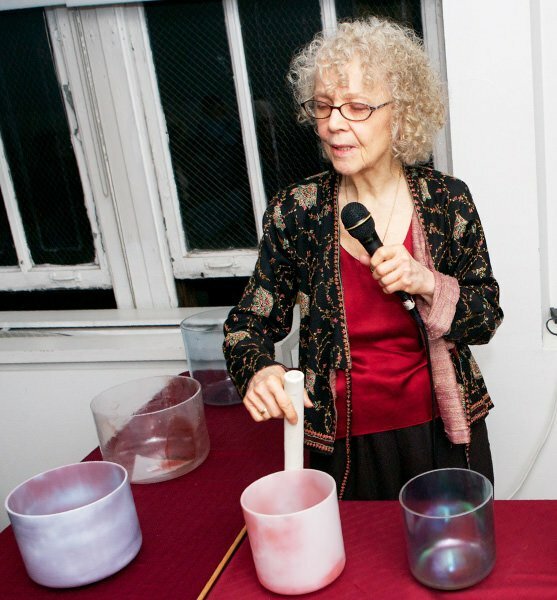 Alchemy Crystal Singing Bowls are made from 98.9% pure silicon quartz. Since the human body is crystalline in structure and contains silica in the eyes, teeth, glands, organs, and connective tissues, the bowls resonate powerfully with our physical makeup. Quartz crystal has the ability to store, absorb, amplify, transform, focus, and transfer energy. The Alchemy Crystal Singing Bowls emit “pure tones” that vibrate the body on a molecular level, since every cell contains silica in the same formula as natural quartz crystal. The vibrations recharge your energy to help your body return to a state of optimum health. Everything is energy: the sun, the moon, the stars, trees, flowers, animals, furniture, rocks—and of course, YOU. In quantum physics, the energy that surrounds us is called the electromagnetic field. In holistic healing, we call it the energy field or aura. Energy can be defined as the force that infuses the universe with life—the divine spark that runs through everything. This life force energy is what heals us. You could call it God, spirit, the divine mystery, or light. Whatever you call it, none of us would exist without it. The photograph to the left is an artistic view of energy moving around a body. 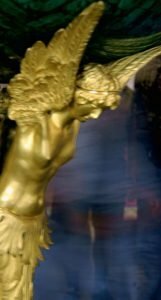 Here in this instance, a gold leafed sculpture. 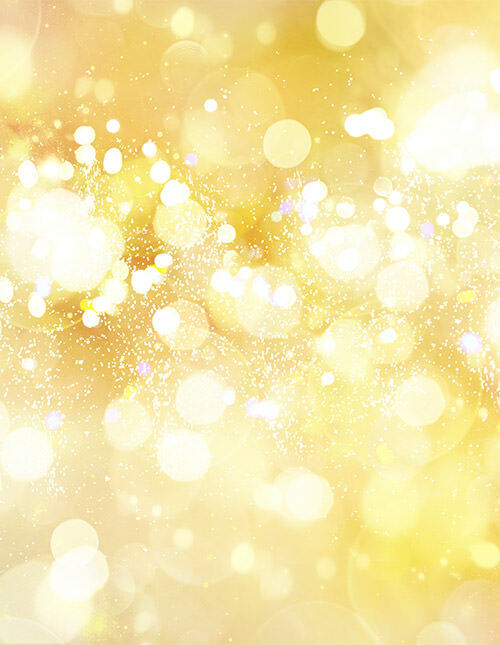 The gold, in my opinion makes it energetically alive. What does energy have to do with healing? The human energy field encompasses more than just your physical body. It includes the four “subtle” bodies: physical, mental, emotional, and spiritual. When stress and trauma create a disturbance in the flow of energy through your subtle energy bodies—particularly in the chakras, your body’s energy centers—it can cause cellular distortions. These distortions, in turn, become underlying weaknesses, imbalances, and blocks that can develop into physical symptoms and dis-ease. Diamond Portals of Light Healing directly addresses the cells and DNA to heal the root cause of your discomfort or illness. How is it possible to sense an energy field? Everyone senses energy. It’s the force that attracts you to some people and repels you from others. Some people have the innate ability to “see” energy fields, or auras, with the naked eye, while others perceive them through different senses. 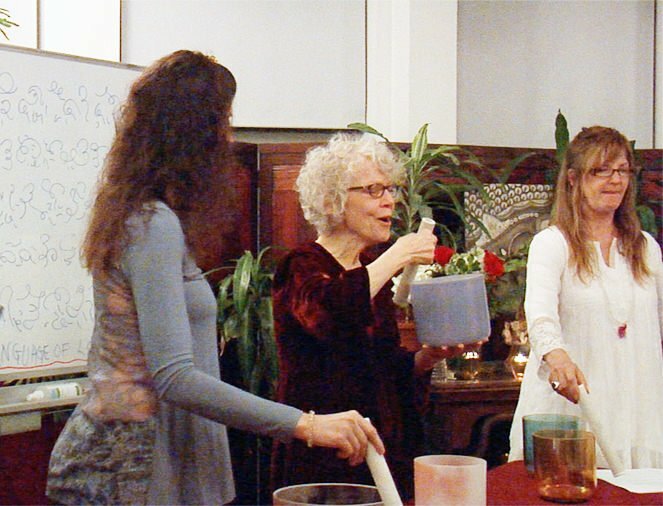 Barbara Brennan labeled this heightened ability to sense energy High Sense Perception (HSP). The Brennan School of Healing Science trains healers to use HSP in working with energy fields and chakras, with the intent to help clients release and heal energy imbalances. Why would I need energy healing? Disease typically stems from trauma, negative beliefs, or childhood wounds. Any experience that upsets or hurts you causes an imbalance in your energy field. The longer these experiences stay in your energy field, the more opportunity they have to cause physical, mental, emotional, or spiritual illness. Symptoms generally manifest after years of being energetically out of balance with yourself and your environment. Diamond Portals of Light Healing can get rid of the toxic buildup in your energy field before it manifests in your life—like flossing to get rid of plaque before it creates gum disease. How does Diamond Portals of Light Vibrational Healing work? Vibrational energy healing works by healing the wounds that have been festering in your energy field. The Light transforms the wounds when it comes in contact with them. Just like alchemy transforms one substance into another. Only Diamond Portals of Light is a higher vibration and a finer frequency. For example, it can transmute a toxic emotion to a healthy emotion or a distorted cell to a healthy cell. 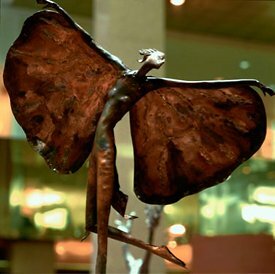 I am the alchemist who sparks your innate healing wisdom—but it is you that performs the transformation of change. I simply serve as the conduit for your healing to begin by clearing a path for you to repair energy blocks, heal emotional trauma, and ultimately attain health and balance. What are some benefits of Diamond Portals of Light Vibrational Healing? Physical: Rejuvenate and restore Your Body; Alleviate pain; Prepare and recover from surgery; Repair damaged cells; Have great physical stamina; Regain full night sleep; Become lighter and more positive. Miracles will happen! Emotional: Enhance Your Inner Light; Connect with and release damaging emotions; Release obstacles that block your happiness; Heal childhood wounds or traumas; Enjoy more fulfilling relationships; Navigate your life with grace and ease; Fully embrace your life with great joy!